I’m a huge proponent of hearing protection while motorcycle riding. Long exposures to elevated noise levels WILL permanently damage hearing. And it’s not so much of the engine or exhaust noise, but the wind noise generated when riding at speeds that is blasting at the rider’s ear drums. Some of you may have known that I had a poor experience with Pinlock’s motorcycle riding-specific earplugs. While they DO filter out the wind noise while keeping conversations legible really effectively, they get very uncomfortable after a long ride. My ears would hurt. And I wasn’t the only one experiencing this – 2 of my other riding buddies had a similar discomfort experience with Pinlock. 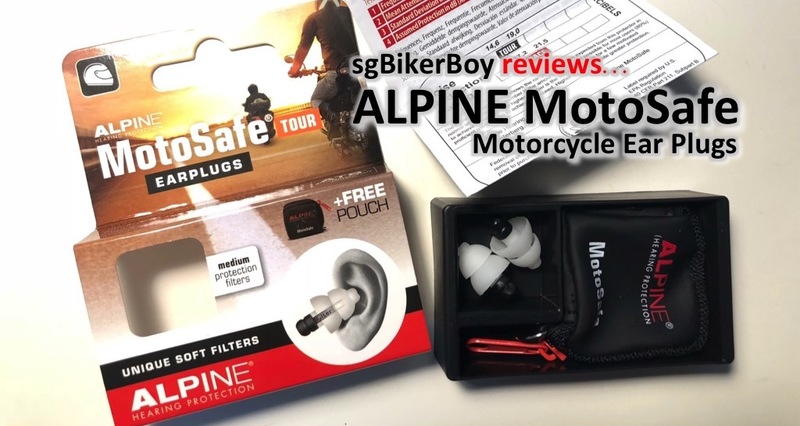 Alpine MotoSafe Tour earplugs – $35 from MotoWorld Singapore. The Apline MotoSport earplugs come in 2 versions – Tour and Race. While the Race version seem to have slightly better noise reduction rating (NRR) – blocking out more engine noise, the Tour version was specifically built for motorcycle touring and would likely be easier to hear conversations with the plugs stuffed inside the ear canals. 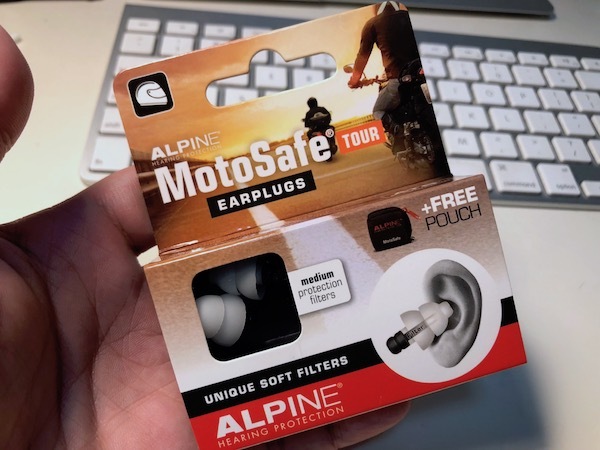 The Alpine MotoSport Tour earplugs, like the Pinlock ones, come with a noise filter. This specially-tuned filter blocks out unwanted noise (such as wind, engine, exhaust), and allows in the “wanted” sounds – conversations, sirens and horns. And it works really well! 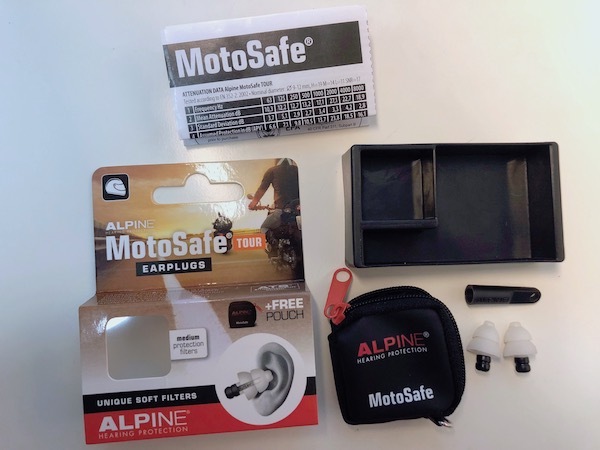 The package contents of the Alpine MotoSafe Tour earplugs. The package contents appears very complete – it even comes with a soft pouch for carrying the earplugs! Also include is a plastic applicator tool. Now, because the earplugs are completely soft, I found it initially difficult to insert them into my ears properly and have a good seal. The included plastic applicator tool made it easier to put them on. But I must add that after a few applications and getting used to the earplugs, I now no longer require the plastic applicator to put on the plugs and yet have a good seal. But in any case, kudos to Alpine for including it! The included carrying pouch and plastic applicator with the earplugs. Yes, the ENTIRE ear plug is made of some super-soft, super comfy silicon-like material. There are no hard bits at all. And unlike the Pinlocks, nothing needs to be removed before washing them in warm soapy water for easy regular maintenance and hygiene. I’ve taken them on touring and some long rides. There was even a recent whole-day 1000 Corner Malaysia ride where I had the MotoSafe earplugs on almost the entire day. They remained soft, comfy and my ears didn’t hurt at all. Nothing! Zilch! Not even a little sore! 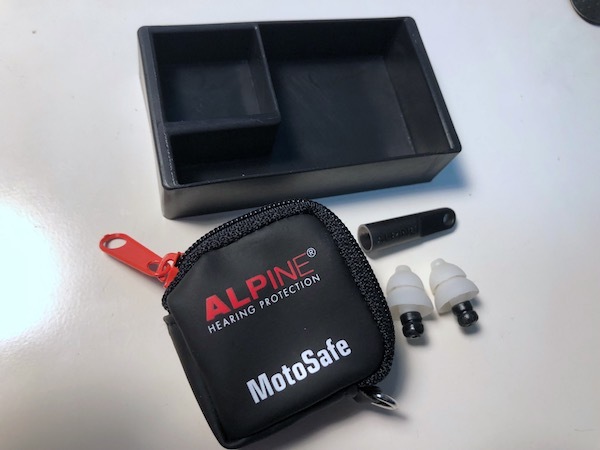 So, if you don’t mind spending $35, and if you’re looking for some super-comfy, reusable motorcycle-specific ear plugs that blocks out unwanted noise while letting in the “wanted” sounds, give the Alpine MotoSafe Tour earplugs a go! I use the oxford disposable ones that cost 2 bucks for 2 pairs and they have a claim. Of 33db reduction and i dont have problem listening to music with my sena 3s..
That said, the goal behind putting on earplugs when riding is not noise isolation, but noise reduction. These motorcycle-specific earplugs will NEVER have high NRR because, by design, they actually DO let sounds of select frequencies through! And in real world use, I’ve never felt the plugs with noise filters (Pinlock and Alpine) to be any more fatiguing then the 3M 1100 foam plugs which I previous used. Ah indeed the claim is only their’s. However, amongst the lot of disposable ones I ve used, these seem to do the best job. For me noise isolation is the highest factor, and the. Oxford ones do a great job. Most of my rides are solo and those with friends are without any form of comms. My other reason to stick with disposable ones is the nagging fear of losing my earplugs on a trip. Yeah – that true. Cheap to not feel painful for the accidental loss. I am using the Pinhook ones now, but because I have small ear canals they don’t fit as well as foam plugs. Compared to the Pinlock’s, the Alpine’s are no easier nor more difficult to insert once I got used to them. I am trying to decide on the type of hearing protection that allows me to still listen to music and still hear emergency vehicles or horns. Cost is also a factor. I’m also seriously considering getting the custom molded plugs with built in speakers. http://www.hearsmart.com/afe-2-dual.html They are a lot more money. Has anyone out there had experience with these? I’m not quite a music-while-riding kinda guy. My Sena’s main duties are bluetooth comms when I’m with my riding buddies, and audio podcast streamed from my iPhone when I’m riding alone. Thus, my needs are speech fidelity, clarity and legibility. So such earplugs with frequency-tuned filters suit my use-case. ACS single driver and dual driver will cost $658SGD and $958SGD. 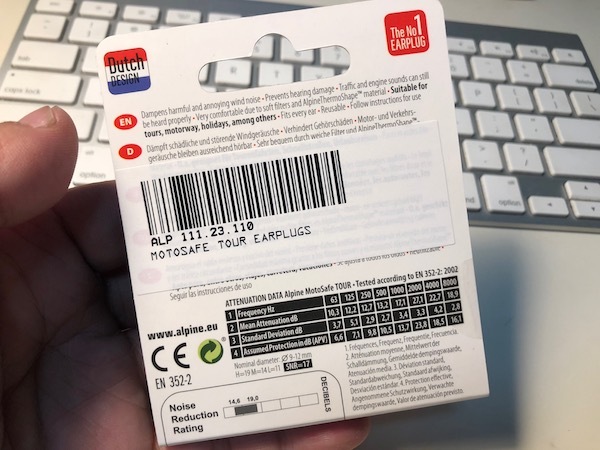 Hi where did you get your alpine ear plugs from? Checked out amazon but this product doesnt ship to SG. For these type of earplugs do you need to roll them before inserting into the ear? No rolling required. I just insert them. Easy peasy. The Alpine earplugs comes with an insertion tool – which I found that I didn’t need to use. ← BMW Grip Replacement on my CB400X ← Motul 7100 4T – French or French Colony?